Growth factor receptors play a variety of roles during embryonic development and in adult homeostasis. These receptors are activated repeatedly in different cellular contexts and with different cellular outcomes. This begs the question as to how cells in a particular developmental, spatial and temporal context, or in adult tissue, interpret signalling by growth factor receptors in order to deliver qualitatively different signalling outputs. One mechanism by which this could occur is via endocytic regulation. 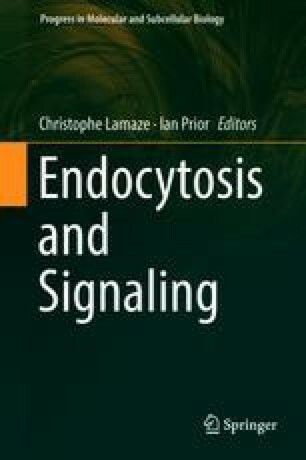 The original paradigm for the role of endocytosis in growth factor receptor signalling was that receptor uptake has a quantitative role in signalling by reducing the number of cell surface receptors available for activation and targeting activated receptors for degradation. However, a range of studies over the last several years, in many different experimental systems, has demonstrated an additional qualitative role for endocytic trafficking in receptor signalling, with specific outcomes depending on the location of the signalling complex. Confinement of receptors within endosomes can spatially regulate signalling, facilitating specific protein interactions or post-translational modifications that alter throughout the trafficking process. Therefore, endocytosis does not simply regulate cell surface expression, but tightly controls protein interactions and function to produce distinct outcomes.